SECOND CHANCE COCKER RESCUE – Page 55 – Saving lives one dog at a time. Tons of Cockers, Great Food and Fabulous People! 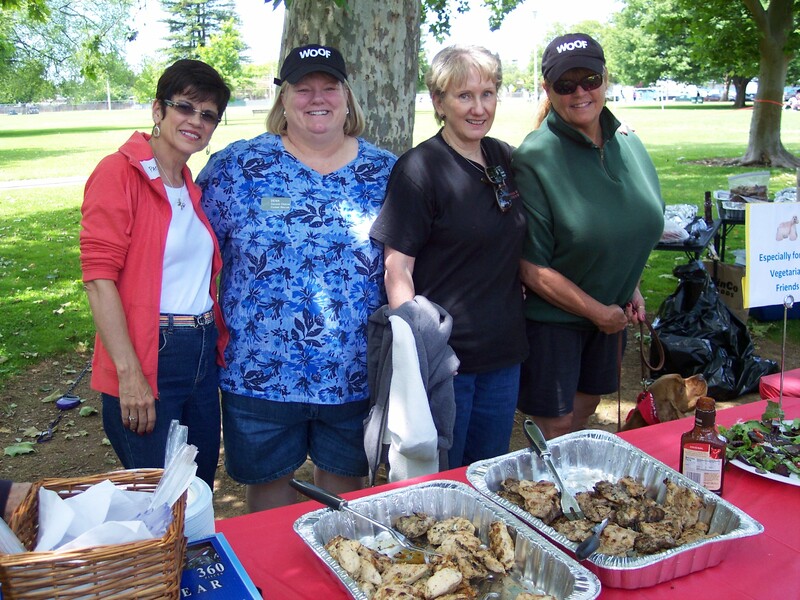 The Sacramento picnic last Saturday was a resounding success. We had a huge turn out and the prettiest group of Cockers you have ever seen. The food was fabulous and the raffle prizes amazing. It was a perfect day and everyone had a wonderful time. Carole Barone not only won first place on the cash raffle but she got picked for second prize too! Then she donated all $750 right back to SCCR!! Wow, we love you Carole! Thank you, everyone, for your help in making this event a huge success. 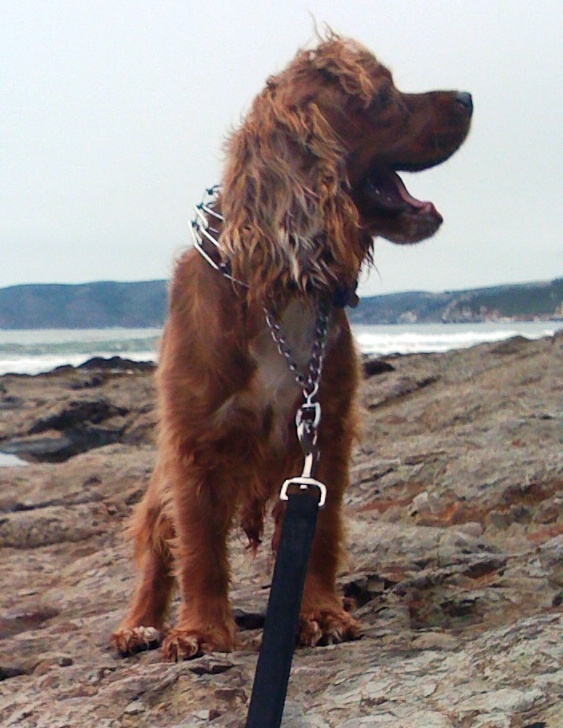 Chewie was adopted by a wonderful couple in Shell Beach after having a very rough start in an abusive home. He was so anxious his mom had a bit of project on her hands getting him to relax and enjoy life normally. We just got a progress report from his mom that we wanted to share with you. I just saw the newsletter that you sent out, and thought that it would be a good idea to send you an update on Chance (formerly Chewie). We’ve almost had him for two months now, and I could not imagine our lives without him. He is 99% less anxious than when we first got him. He’s able to just lay down and cuddle all day and be a lazy little pup, which is amazing. When I first met him, I would never have imagined him doing this- but right now he is curled up sleeping under my arm. He’s a pampered little man now. We go to the beach all the time and he loves it. His favorite part is meeting kids- whenever he sees little kids he starts whining and trying to get to them. He’s very gentle with them and loves playing with them. He knows “sit” and “stay” and he taps his ball before it gets thrown for him. He goes running downstairs and sits at the front door when “Puppy Walk” is announced. 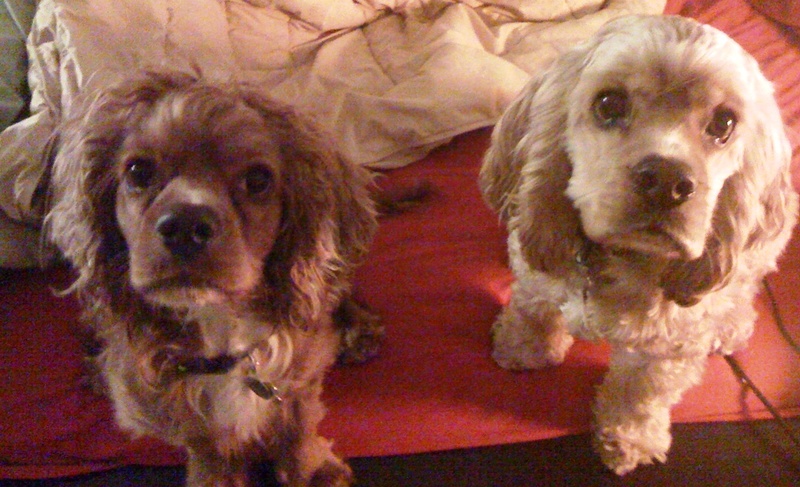 And he and Max, our other cocker spaniel, are friends who are growing more and more attached every day. Max got stung by a bee last week and he only wanted to curl up next to Chance, and Chance was so worried about Max- he was as anxious as the first day that we met him. Chancey sleeps in between Trevor and I every single night, and he is a little cuddle monkey. When he gets tired and decides that it’s bedtime he starts digging at the covers and talking to us. He won’t get under the covers until the light is out, but once he does he is asleep in 5 seconds flat and he snores like a little drunken sailor. He is a part of our family and we love him so much. I also wanted to let you know that we spread the gospel of rescue and Second Chance Cocker Rescue specifically. I meet so many people at the beach and at the dog park who compliment me on my beautiful well behaved dogs, and I always tell them that they are both rescues. A lot of people are surprised that there are rescues for specific breeds, and a lot of people are surprised that rescues can be well behaved and ‘normal’. So I always tell them about your work and encourage them to adopt. So many people tell us that our dogs are lucky that we adopted them, and I always always tell them that WE are the lucky ones. Thank you so much for rescuing our little man until we could find him. He’s a forever part of our family. The pictures are of Chance in bed under his blankets with some tennis balls (he loves being in tons of blankets and still seems amazed that there is a whole basket of toys! ), Max and Chance together, and Chance having fun at the beach. If you ever want to tell our story as a success story for fundraising, that would be fine with us. Winston was found last month in LA County abandoned in the backyard of a house that had just sold. The buyers started to moved in when they found him hiding in the back yard. He was a mess. His family left him alone with a bag of dog food, torn open so at least he had something to eat. Being a Cocker, he had eaten way too much of course. We got him cleaned up, checked by a vet and then introduced him to Melanie and her family from Toluca Lake. It was love at first sight. Winston has found his truly forever home. We will be holding two drawings this year, one at the Sacramento Picnic on June 11 and one at the Santa Barbara Picnic on July 9. Every donation made in in honor of Mr. Marvin from Sacramento will enter you in the Sacramento drawing. Mr. Marvin came from the Tehama County Animal Shelter. He was found abandoned with another dog in a backyard. They don’t know how long they were there, but Mr. Marvin was curled up next to his dog pal who had already died. Mr. Marvin was emaciated, had cherry eye in both eyes and needed to be neutered. He probably has never known the comfort of a lap or dog bed or kindness from people, but he is a true survivor and a sweet, loving, gentle soul. He is now in a trial adoption with a new family. Keep your fingers crossed! Donate in Honor of Mr. Marvin. Every donation made in honor of Sammy will enter you in the Santa Barbara drawing. 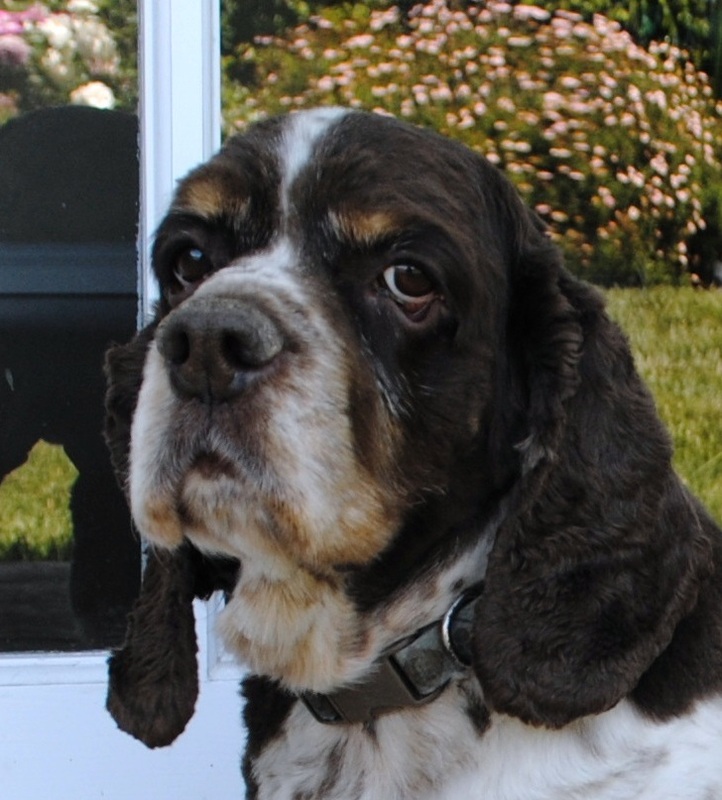 Sammy had been wandering the streets of Lancaster for weeks trying to survive on his own. He was skittish, scared and starving. A local rescuer, Debbie, managed to catch him and brought him to us in Santa Barbara. His teeth were a mess and after a teeth cleaning where he had to have 22 teeth removed, he is so much happier. He is now a pampered, sweet, loving little boy waiting for his permanent home in foster home where he gots tons of love and two square meals a day. Life is good! Donate in Honor of Sammy. All proceeds of this raffle will go to pay off the medical expenses for Mr. Marvin, Sammy and our other Cockers. Annual Cocker Reunion Picnic—You are invited! Join us in celebrating all of the Cockers we have rescued, the families that have taken them into their hearts and homes, and the volunteers whose dedication and commitment make it all possible at our Cocker Reunion Picnic. We hope that all of our Cocker Spaniel alumni and their families will be able to join us. Dog lovers and everyone who loves happy endings are invited, as well. We will be serving a BBQ chicken lunch with a vegetarian option for a $15 donation. We will have raffles, great food, vendors . . . The Sacramento picnic is on June 11 at Tahoe Park, cross streets are 10th and 60th Streets, Sacramento, CA. RSVP before June 1 to savak9@sbcglobal.net. 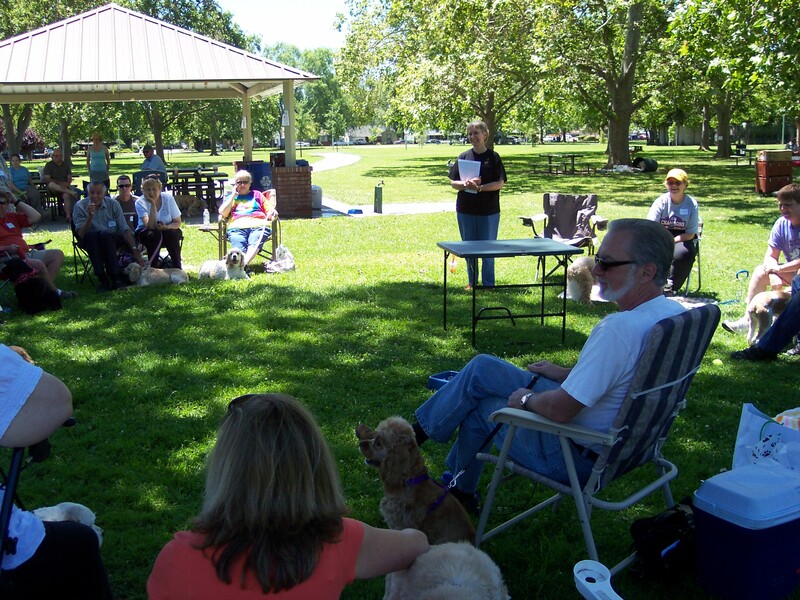 The Santa Barbara picnic is on July 9 at Toro Canyon Park, Area 2, Carpinteria, CA. RSVP before July 3 to elizabeth.mazzetti@cox.net. 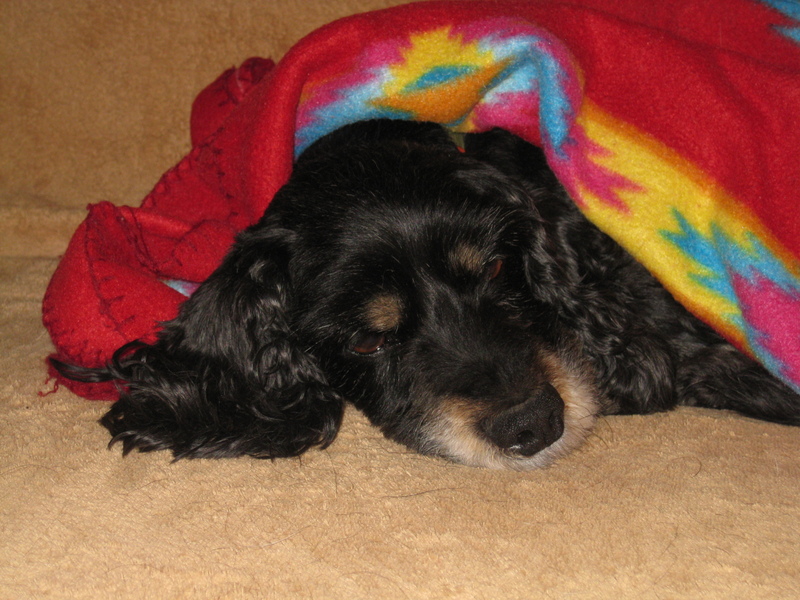 Last year (2010), I lost my 15-year-old Cocker Megan. I felt my life no longer had purpose, my son grown and living out of state. In December, I found Bella! Bella is a special girl coming from a local Cocker Spaniel rescue. Bella is 12 years old and fills my days with smiles and joy. We live in a senior apartment complex where my neighbors all know her and always are met with a wiggle. Bella is totally deaf, but she knows my every move. When I go to take a nap or to bed at night, within a few minutes she moves to my bedside. She’s close to me all the time, she is with me at all time. PURPOSE– is what she gives me, to take care of a senior dog. Not knowing what her life was like or why she was given up, make her that much more deserving of a permanent home with ME. Two old gals just loving each other, me and my Bella. 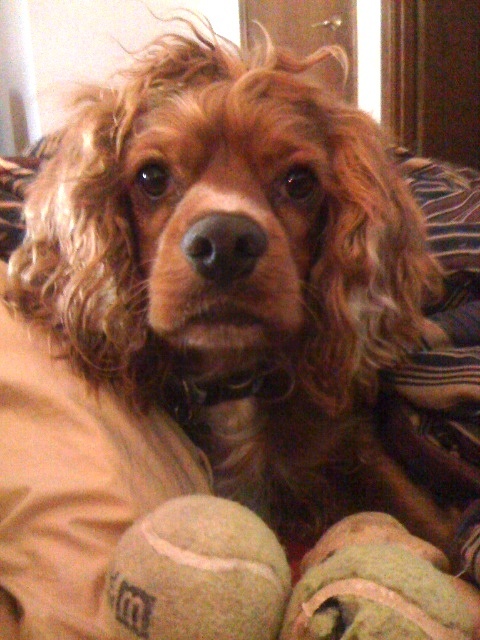 Little Chance is not exactly all Cocker, he is not even all spaniel, but he is darn cute! 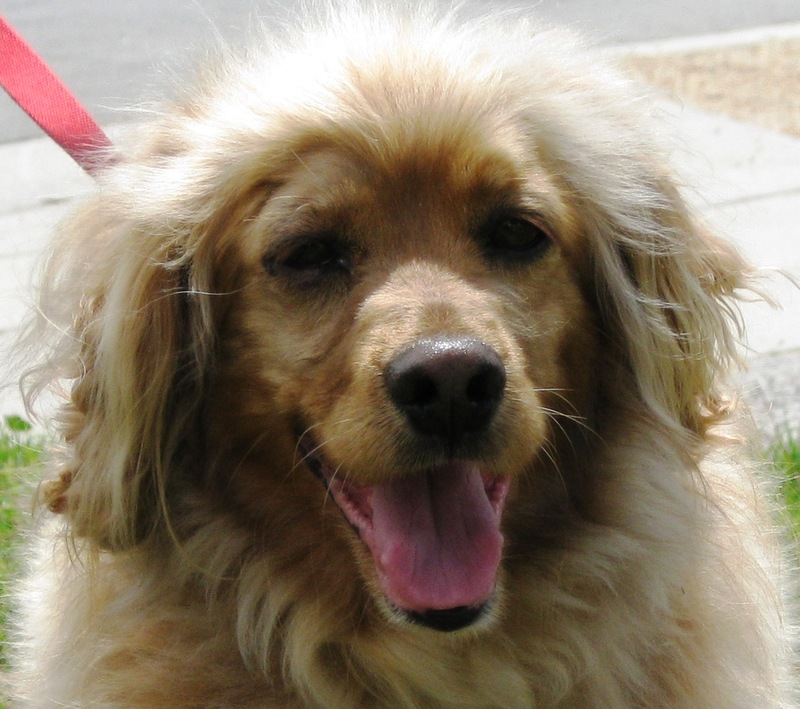 Chance is a sweet, gentle soul who will be the perfect family dog once we get his teeth cleaned. His breath will knock you over. His teeth are so bad, he might not have too many left when they are done, but he will feel so much better. He is only 5-6 years old, but it looks like no one has taken care of his teeth his whole life. He is going to have a huge bill. 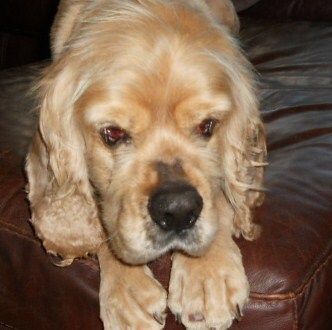 If you would like to make a donation to help pay Chance’s bills, please go to DONATE. Chance was adopted by a wonderful woman in Incline Village. He now gets to run on the beach at Lake Tahoe everyday . . . Lucky boy!